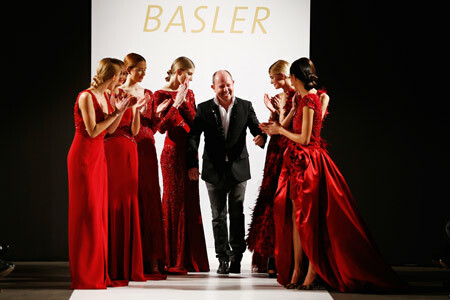 Presenting LONDON as the theme at “Platform Fashion” in Düsseldorf, Basler staged a spectacular show, with many Basler favourites in the Front Row. Closely watching were Princess Elna-Margret zu Bentheim und Steinfurt, Gräfin Stephanie von Pfuel, Dagmar Kögel, Magdalena Brzeska and Jennifer Knäbel sitting in the front row. Thirty models worked the runway. Among them, Rebecca Mir, Luisa Hartema, Julia Trainer, Jana Drews, and Nieves Alvarez, in a stunning fireworks display of luxurious materials and warm colors. The Crown Jewels in the tower of London? The perfect colours for Fall/Winter; rich tones of Sapphire, Amethyst, and ruby pop with sophisticated tones of camel, anthracite and black. The Penthouse apartments overlooking Hyde Park? Perfect for the Modern Basler woman. London nightlife? Ideal for the woman who wants to look cool, cosmopolitan, and exciting. Home to style icons like Kate Moss, Jerry Hall, Sharon Osbourne, Elle McPherson, and Helen Mirren, women of different ages who each have their own individual look, London is the backdrop where all things are possible. And Basler makes it happen. It’s all about modern classics with an unexpected twist; reinterpreting lace, leather; reinventing leopard and patchwork. Signature details abound. There’s the luxe of handbags and belts. The feeling of dresses that wrap, drape, and flatter every figure. The newest of jackets – modern and shapely. 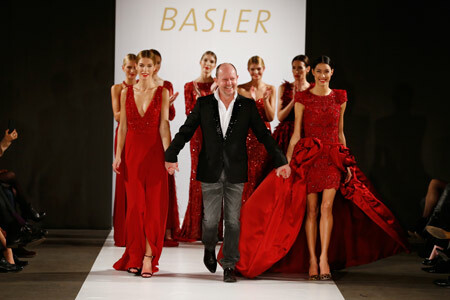 The message is clear: Basler wants to make you the star! The Basler heritage, steeped in the tradition of understanding coats – their style, their function, their form - is another source of inspiration for Brian. Basler, a company founded in Berlin iseventy years ago made their first debut with coats and jackets. And it grew from there. Today Basler is an international company, with stores in all continents. The Basler Collections are always feminine, exclusive and very modern, with perfect fit and international flair. Designed by Creative Director Brian Rennie, there is always an element of surprise, a bold mix of pattern and print. 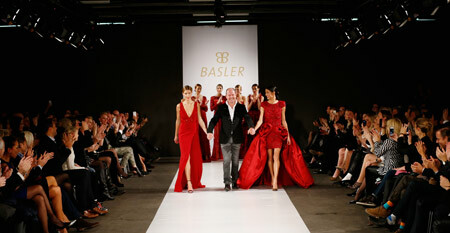 From Sporty to Couture to Event dressing, Basler has collections for all market segments with excellent price points.